We are "Alexander-Lee Gallery", also known as, "Venetian Beads.Com", (the original Venetian Bead web site). We have been direct importers, since 1976, personally travelling to Venice and Murano to meet with our bead makers and make our selections. 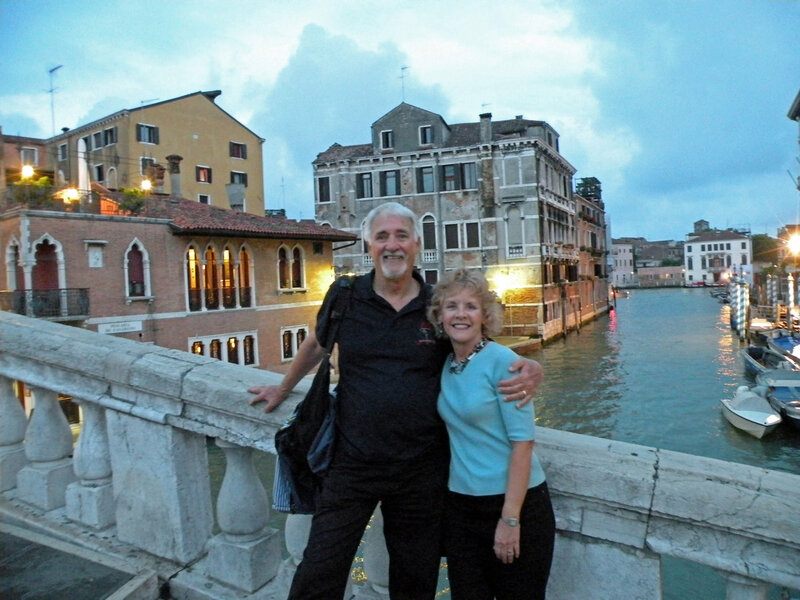 Susan and Phillip Holland of Houston, Texas, U.S.A.
You may be wondering how a couple from Houston started importing and designing the finest Venetian Glass Beads and Murano Glass necklaces. Let us tell you a little history of this facinating story. After college, we both worked for separate companies in Houston, where we met. 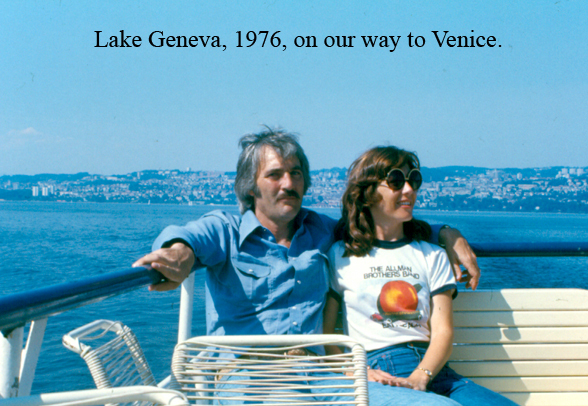 As a young couple, we both loved to travel, (and still do today). In 1976, we started our business. On one of our first trips to Europe, and to Italy, we bought Venetian Glass Bead necklaces and later sold them, not only at our showroom; which we had for 20 plus years, but also at trade shows. We always received compliments on our showroom, being known for having two beautiful items; art and jewelry. We were both avid photographers. Actually, Phillip was a photographer first, and got me involved; we both won many awards for our photography, especially "travel photography" and "photojournalism". Phillip sold some of his framed photography. At our showroom, we sold both custom framed and loose art pieces by, not only American artists, but also artists from all over the world. From our many travels, we hand carried back art pieces by artists from Europe; especially France, Spain and Italy; from Hong Kong; and from Brazil. We both went to custom picture framing school, in Charlotte, North Carolina, to learn how to properly frame art pieces. Our sense of color, we learned in photography and art, would later come in handy in designing Venetian glass beads and necklaces, and working with our glass bead makers. Since we were selling jewelry, we decided to become "experts" in jewelry, and went out to Santa Monica, California to live for six months, and attended the Gemological Insitute of America. We graduated, earning our diplomas as "Graduate Gemologists in Residence"; (no correspondence course for us). We then travelled to Bangkok, Thailand; Hong Kong; Rio de Janeiro, Sao Paulo, Minas Gerais, and Belo Horizonte, Brazil: and Idar-Oberstein, Germany, to buy gemstones, (and some art). We also travelled all over Europe: to Spain to buy porcelain, Las Gorditas, and especially LLadro, and purses; to Italy: to Florence to buy purses and leather gloves; to Sorrento to buy inlaid wood art pieces, music boxes and inlaid wood tea carts; to Torre del Greco to buy coral and cameos, and to Venice and Murano to buy Venetian Glass Beads and Murano Glass. When we first started exhibiting at jewelry shows, we put out all our fine jewelry, both loose gemstones and finished jewelry. We had space open on one side of our booth; so we filled it with Venetian Glass Bead necklaces. We sold a lot of gemstones, but we "sold out" of all the Venetian Bead necklaces. Customers were saying they had never seen such a great selection and at such low prices! While we have long been enamored by the scintillation of a diamond and the chrome induced colors of ruby and emerald, our attention has been held these many years, by the romance of Venetian Glass Beads and the stunning fashion accessories they become. Under our company name of Alexander-Lee Gallery, we exhibited at International Gem & Jewelry Shows all over the United States: San Diego, Santa Monica, San Mateo, Seattle, Portland, St. Louis, Chicago, Detroit, Columbus, Baltimore, Marlborough, Boxborough, Washington, D.C., Atlanta, Dallas, Austin, Houston, etc. We exhibited at Bead Expos, Embellishment Shows, Bead and Button Shows, Quilt Shows, Italian Festivals, in various cities: Houston, Austin, Sacramento, Portland, and Santa Fe, to name a few. We also exhibited at wholesale jewelry and gift shows: The California Gift Show in Los Angeles, Atlanta Gift Show, and Chicago Gift Show. And for 20 + years we had a large booth at the Tucson, Arizona, Gem & Lapidary Wholesaler's Show, (GLW show); and now exhibit at the Houston Gem & Mineral Show. Needless to say, we did shows covering East to West and North to South; introducing Americans to Venetian Glass beads and Murano Glass jewelry and gift items. When we first started exhibiting the Venetian Glass beads at shows; there were no imitation beads, no "knock offs", no poor copies of Venetian beads made in India, or China, or Czech Republic, (Czechoslovakia then)...they were not around. There were no American bead makers on the scene, who began arriving in the mid '80's, and there were no "bead shows". We were first, we've seen it all happen, we've experienced it, we've "shaped history", and we are still faithfully here. We have been importing and selling handmade, Venetian glass beads and Murano glass jewelry continuously since 1976. We still love to travel, and still, personally go to Venice to meet with our many bead makers. From the many designs we carry, we have selected some of our most beautiful Murano glass bead necklaces. The Murano glass beads that comprise these designs are "lampwork" beads; which simply means they are glass beads, handmade, one-by-one, under the flame. If you are one of our valued, past customers of loose, Venetian glass beads, or Murano glass jewelry, you know that we helped to start the "bead revolution" in the United States. We were first to bring you 24 karat gold foil beads and first to bring you silver foil beads. And when the silver foil beads "oxidized", turned black on the ends, we asked our bead makers in Venice to use "white gold foil"; hence, starting the beginning of white gold foil beads; often called "platino" for platinum, in Venice. We were the first direct importers to bring you the "Art Beads", in the style and paying homage to the artists: "Klimt", "Miro", "Missoni", "Monet", "Jackson Pollock", "Picasso", etc. We invented names for beads that, not only many of the Italians now use, but that are known and copied worldwide; such as: "lentil" beads, "potato chip" beads, "baby" hearts, "flat cubes", "twists", "coins", "spirals", "skinny rectangles", etc. We were first to "invent" beads in the "Rubino Oro" color. It came about when I was looking through an old "Vetrerie Moretti", chart of glass canes (or rods) and saw a color named "Rubino Oro". No one in Venice or Murano was using this colored cane to make any beads. I then called one of our best bead makers and asked them to contact Moretti, and to have some glass rods made in the "Rubino Oro" color. Then we asked our bead maker to make up the beads, in various shapes: baby hearts, flat cubes, triangles, dopio conos, discs, squares, etc. ; to put the "Rubino Oro" glass over 24 karat gold foil; which makes the bead a persimmon pink color. On our next trip back to Italy, we noticed "our" Rubino Oro colored Venetian beads in jewelry, in store windows all over Venice! Then later, for Spring, we invented, "Rubino Platino"; when we asked our bead makers to use the same colored glass rods, but this time, when making the beads, to melt it over white gold foil, or "platino"; which makes the bead a rosy pink color. Now you see both Rubino Oro and Rubino Platino Venetian beads everywhere, but, we started it; so every time you wear those colored beads, think of us. We've personally designed beads, drawn out designs to be made into beads and jewelry, and have two of the very best Venetian bead designers: "Alessandro" and "Valentina Moretti", making designer jewelry for us. We could show you thousands of Venetian beads; but we chose to bring you only the very finest quality Venetian beads and Murano Glass, direct from Venice, Italy, at the most reasonable prices. Hope you enjoy our selection.